After arriving safely in New York City on Sunday, we visited our first project the following morning. 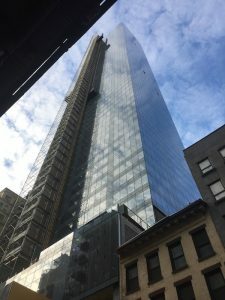 Located in Manhattan’s financial district (four blocks from One World Tower), 19 Dutch is a 63-story residential apartment skyscraper which is approximately 750 feet tall. 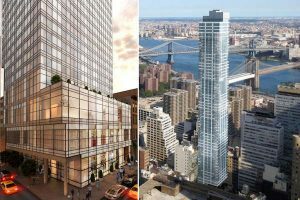 Upon completion, the 118 Fulton Street project will have 483 units for rent which is split 80% market rate and 20% affordable rate. The owner, Carmel Partners, is well known throughout the U.S. and has completed many projects within NYC. 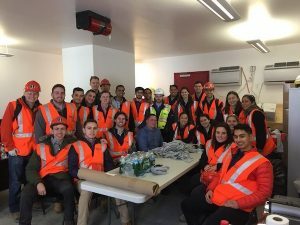 Operating on a CM type contract, Gilbane is the general contractor who provides oversight on the project as well as acting as a mediator in conflicts. Unique to the project, there were three different architects who collaborated on the project, all from different firms. One was the exterior architect, one the interior architect, and the third, a base or production architect. The base architect was the main point of contact for the project. Also special to the NYC construction market now is the battle between Union and Non-Union work. This specific project was an open shop job where union and non-union workers could compete to win contracts. Although there is relatively no difference in the quality of completed work, Non-Union work tends to lack behind in office work (paperwork such as submittals) and BIM. While this is a relatively new issue, the union contracts are being reduced in price, decreasing the average 25-30% higher valued contracts compared to non-union work. Although most of the workers on site are non-union, the more complicated trades (elevators, curtainwall, etc.) tend to be union workers. Trade regulations seem to be a major issue hurting the union workers (i.e. 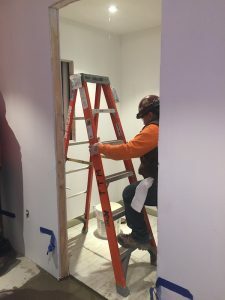 a union electrician cannot use an electric screw gun for outlets while a non-union worker can) On the project, there are about 20 bid packages with a supplemental 20 or so contracts with material suppliers. There are on average, 275 workers on site every day. The project sits on about an 8,000 square foot site with a 6,000 square foot floor plate. Each floor will contain about 9 separate units ranging from studios to multi-bedroom units. 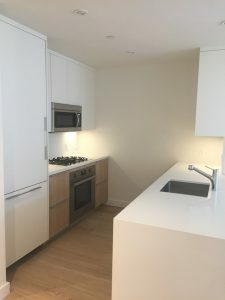 Each unit comes fully furnished with a washer, dryer, stove-top, microwave, dishwasher, and engineered wood floors. Each unit will have a combined soffit and painted, exposed, 9-foot ceilings. The residential tower will also include retail space on the first and second floors. The third and fourth floors will be home to amenity space which will include a cafe lounge, fitness center, meeting rooms, and much more. 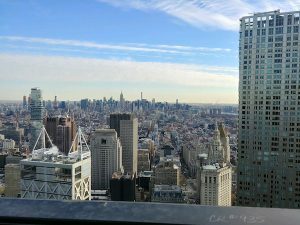 The 63rd floor rooftop terrace will be home to incredible views (as seen below). Ground broke on the project in 2014, however, due to unforeseen ground conditions, the project was delayed. The original foundation sub-contractor had issues with digging 150 feet into the ground to reach bedrock. Already largely behind schedule, Carmel Partners brought in a new sub-contractor to finish the work. Luckily, the new sub-contractor was able to complete the work which allowed the construction to go vertical in November of 2016. By using accelerators in the concrete, the project was able to maintain a 2-day cycle per floor. Self-leveling costs were built into the contract which allowed for larger tolerances during pours. Currently, the building is experiencing all phases of work from complete units to unsealed floors (exterior curtainwall is almost complete). Carmel Partners attributed the major challenges of the site to logistics and water management. Due to the very small footprint of the site and NYC itself, the deliveries and site entry were difficult to manage. The primary delivery was on Fulton Street with the loading dock in the front of the site. The traffic and sheer number of deliveries usually made for a long day. When starting and pressurizing the systems in the building, water management is one of the key challenges faced. As seen above, leaks can cause a large amount of rework and wasted time. Finally, one of the biggest challenges in the construction industry is the constant change in regulations. Especially with longer projects, code can change over time, creating new obstacles to learn and tackle. As a group, we are thankful to have visited the 19 Dutch project and learn from some of the industry’s brightest.